What caught my attention is didn’t look anything like the other faction models. This is important to me because in Dropfleet, unlike Dropzone, there are only four factions. These factions are from the original game’s core factions, of which my faction, Resistance, is not a part. This was ok as I realize that Dropfleet is a new game and they are going to have to grow it. Resistance wasn’t part of Dropzone initially either so I could wait. Except there would be no waiting as the lead designer, creator, and owner of Hawk Wargames was adamant that Resistance as a faction could not be in Dropfleet. Period. End of discussion. Wasn’t going to happen. As a player and rabid fan of both Dropzone and my faction, this sucked. The main reason was it didn’t work with the story. The fluff was getting in the way. From a business perspective, this had to be the stupidest excuse I’d heard. But whatever, arguing this point (believe me, I tried) is like catching George R. R. Martin in the street and telling him how to rewrite the Song of Ice and Fire series. So I ignored Dropfleet and voted with my wallet. They don’t want to support the faction I play, I’ll spend my money on other products. 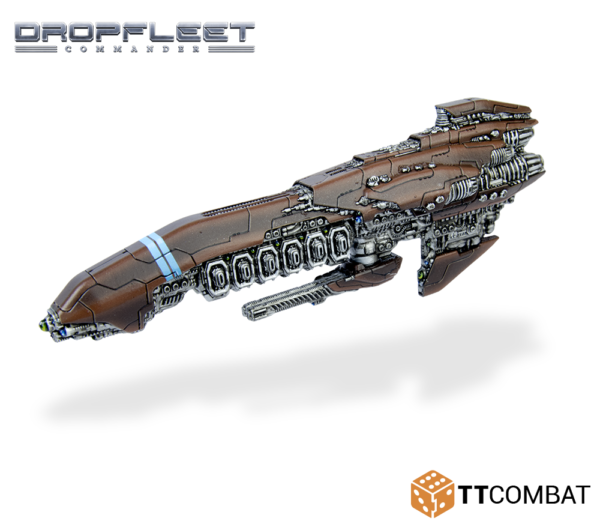 Circling back to this new ship TTCombat posted, they already have “experimental rules” for it and a large piece of story fluff to describe it. The brief blurb on the model itself started getting me excited. The Centurion class was the most common vessel of cruiser tonnage in the pre-war EAA Terran Grand Fleet. It’s simple but effective all-gun primary armament provides an excellent blend of destructive power and reliability. Examples of the class still operating today require low weapon maintenance, a welcome factor that certainly isn’t the case with some of the more esoteric and experimental armaments in mankind’s pre-war arsenal. “Pre-war.” That hooked me as that is what the Resistance faction is all about. Digging into the longer fluff, the whole thing reads like a textbook example of how to introduce the Resistance faction (called the Remnant) into a space combat game. It sounds like the former Hawk guard that migrated to the TTCombat company either are realizing that making better business decisions will keep the lines running better or the higher ups at TTCombat know how to run a successful business and forced the creator’s hand. Either way, I’m thrilled to see that the option may soon exist to run my faction in both games. When the designers first pitched Dropfleet, they had grand plans to be able to link both game systems up to have narrative connections between the two and this is why being cut out of that possibility left such a bad taste in my mouth. Dropfleet Commander isn’t without issues but I’m hoping under TTCombat’s leadership, they can turn it around to make it profitable, produce more content, and grow the line as Dropzone has done.